Copyright Secretariat of AQUA SOCIAL FES!! In connection with the release of the "AQUA," a compact hybrid vehicle from Toyota Motor Corp., a project for waterfront preservation activities throughout Japan called "AQUA SOCIAL FES!!" (that's "fes" for "festival") is gaining the spotlight. At first glance, it seems there is little connection between the release of a new car model and many people gathering on the waterfront as environmental volunteers. How are they connected? The AQUA car was released in December 2011. Soichi Ueda, one of the co-producers of the "Think the Earth Project," who supported Toyota and advertisement agencies as an advisor of AQUA SOCIAL FES!! from the very beginning, says, "This is not in the traditional framework of corporate social responsibility (CSR) activities, but a new method of social communication through the cooperation of companies, nonprofit organizations (NPOs), and individuals. Aqua means 'water,' and as an extension of the experience of manufacturing vehicles with high environmental performance, we decided to carry out activities for waterfront restoration together with people who wish to make a better future." These days, we often hear the word "co-creation," where companies and individuals link up with each other to change society. Meanwhile, this project was named "co-growth marketing" with the aim that companies, society, and individuals will grow together. The AQUA is a car that achieves a world-leading fuel efficiency of 35.4 kilometers per liter and came in first on Japan's monthly new car sales chart by vehicle model in October 2012. The AQUA has been well-received by many young buyers, partly because it is more compact and lower-priced compared to existing hybrid cars. Recently, there has been a remarkable tendency of many young people not owning a car. Against this backdrop, the new method of thinking of "co-growth marketing" caught many people's attention as a new marketing concept. Traditionally, there was a one-way relationship between companies and individuals; companies only provide products and individual persons only use or consume them. However, the concept of co-growth marketing, where three players -- namely, companies, society, and individuals -- interact with each other, aim to build a win-win relationship among all three. Under this concept, while companies can have consumers better understand their brand principle and choose their products, a better natural environment and future can be brought to society, and individuals can enjoy and participate in marketing activities. For the past several years, young people's sense of values has changed, and there has been a growing trend that more of them wish to participate in volunteer activities whereby they can contribute to society or choose brands that contribute to society. 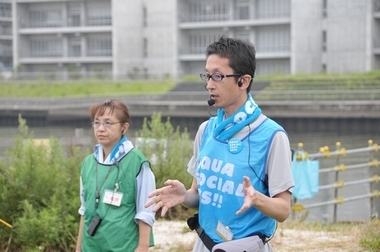 It was a project for waterfront conservation, AQUA SOCIAL FES! !, that was started based on these trends. The project aims to create "'Like' for Tomorrow," which is its catch phrase echoing the social media voting system, not only meaning the car lifestyle provided by the AQUA, but also having a broader sense such as local communities and the environment. 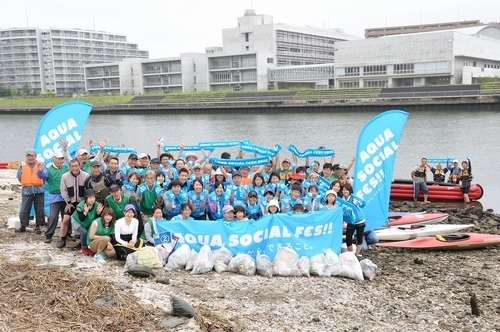 Activities under the AQUA SOCIAL FES!! project began in 2012 at 50 locations in 47 prefectures throughout Japan. In cooperation with local newspapers, NPOs, and other organizations, these activities have been conducted on an unprecedentedly large scale. In 2012, 131 activities were implemented, garnering more than 10,000 participants. Ueda was particularly involved with two activities to preserve the Kitakami River, which flows through Iwate Prefecture and the Tsurumi River flowing through Tokyo and Kanagawa Prefecture. Activities at the two rivers were pursued in accordance with the "watershed thoughts" proposed by Yuji Kishi, another project advisor and a representative of an NPO, Tsurumi River Basin Networking. Toyota selected its Iwate plant as the base of production of its AQUA models, with a view to supporting the reconstruction of the Tohoku Region -- which was severely hit by the Great East Japan Earthquake in 2011 -- by actively creating new jobs there. 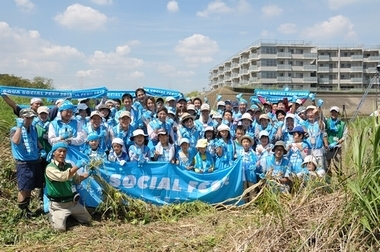 Employees of the Iwate plant participated in activities to restore the watershed of the Kitakami River, which flows near the Iwate plant, under the AQUA SOCIAL FES!! project. They worked together with members of Iwate Basin Networking and Katakuri-no-Kai (an NPO), as well as individual participants. The Kitakami River Basin Restoration Project has started with activities to restore forests so as to conserve the river's water. A piece of land called Hoshimeguri-no-Mori, located near the headwaters of the Waka River, a branch of the Kitakami River, was once a beech forest before it was used as a meadow after the trees were cleared. The meadow was neglected for a long time and became degraded. The restoration project was launched in March, when there was still snow on the ground, and participants "crossed the snow" as a start of the project. They then cleared out underbrush during the fresh spring season. In this way, they worked on activities while observing the condition of the forest all year round. Participants also collected acorns, buckeyes, and chestnuts near the river, sprouted them in pots, and raised seedlings. Then, they planted more than 1,000 seedlings to reforest the land, with the focus on 50 years in the future when the forest will serve as a "tank that stores flowing water." Under this project, the "AQUA-ranger" course was offered to provide young people with basic knowledge in river safety and experience field exercises of rescue operations. Through this course, the human resources needed to provide children with river environmental education and support activities for the river were cultivated. In order to revive the river, it was essential to regenerate the surrounding forests using many people. Throughout this activity, held seven times, participants frequently introduced their activities on Facebook with photos of the AQUA car, which actually played a role as a delivery vehicle. As a result, the AQUA and its performance became widely known, leading to an unprecedented expansion of marketing initiated by the general public. The Tsurumi River is a first-class river (managed by the national government) with an overall length of about 42.5 kilometers, running from Machida in Tokyo into Tokyo Bay in Tsurumi Ward in Yokohama, Kanagawa Prefecture. The Tsurumi is an urban river with a total watershed population of 1.9 million. 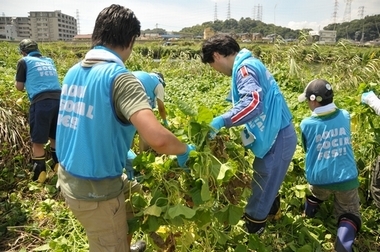 Jointly with NPO Tsurumi River Basin Networking, nine separate events for restoration have been conducted around the upstream, midstream, and downstream areas. In the midstream area, participants engaged in cleanup activities in the spring. In the upstream area, they planted nettle tree seedlings, in an attempt to improve the water-storage capacity of the forests as well as to conserve Japanese aquatic fireflies and great purple emperors (Japan's national butterfly species, now endangered). In the downstream area, which includes the tidal flats at the river's mouth, they conducted cleanup and alien species elimination activities. In this way, participants conducted nature conservation activities throughout the year. The most programs held in Japan were in and around the Tsurumi River, and many other events were held there. Throughout the four seasons of the year, many activities aimed at learning about nature have been conducted in this river basin, such as walking tours in spring, firefly viewing in early summer, canoe trips in summer, and "bioblitz" events, in which participants collect, sort, and observe the many creatures living in certain areas, and seed bank creation activities in autumn. Many people actually worked hard together to revive the Tsurumi River, which once was seen as symbolic of Japanese landscapes. One of the participants in this project said that she really enjoyed it because she met various people. Among the participants, there are some children who took part in every program offered in the project here. The number of participants in the "AQUA SOCIAL FES!! 2012" events held in the Kitakami River, the Tsurumi River, and other water areas across the nation amounted to 11,533, ranging in age from a newborn baby to a 91-year-old. According to the answers on questionnaires given to the project participants, many responded that "the programs sounded enjoyable" or "I want to do something good for society" to a question asking why respondents participated in the project. As for the question asking if the participants felt a sense of achievement after actually participating, 87.9% of respondents answered either "I felt a sense of achievement," or "I felt somewhat a sense of achievement." Furthermore, in 2012 the AQUA SOCIAL FES!! project won the Sustainable Design Award, one of the categories under the Good Design Award, a comprehensive program for the evaluation and encouragement of design organized by Japan Institute of Design Promotion (JDP). Under the concept, "When a company changes how it spends on advertising, society changes. We design how we spend on our advertising," Toyota believes that it has actually contributed to society through its spending on advertising. The reason for the award is that a consistent context can be found in the company's activity development where the theme of a "sustainable society" derived from the world's highest vehicle fuel economy, whereby the company named its product AQUA and further started various activities to protect aquatic environments. "I didn't expect so many people would actually participate in our activities. Every participant worked very hard, and that's why they felt a sense of achievement when reaching the goal. In order to change society in Japan, where many people are employed by companies, companies should change first, which then brings about changes in society. I think this is a very important point. Having said that, we are surely happy to see individuals changing society, but we could say that co-growth marketing is a method symbolizing the generation to come," says Ueda, who was engaged in this project throughout a year, showing his confidence. Replanting forests and protecting water environments are issues that cannot be solved by a one-time activity. Toyota's AQUA is a compact car with a 10-year vision, and AQUA SOCIAL FES!! is not a one-time marketing stunt either, but an activity to be undertaken for the middle to long term. We will continue to watch how it will unfold into the future.